Where are we currently in the natural Milankovitch cycle? The natural cycle that people refer to regarding large scale climate change is the time between ice ages and warm periods. The long cycle time is about 100,000 years. We can spend around 20% of the cycle in an interglacial and around 80% in an ice age, depending on where we are in these cycle influences. What causes this are the natural cycles that influence earth climate – the Milankovitch Cycles? The Milankovich cycles are caused by changes in the shape of the Earth's orbit around the sun, the tilt of the Earth's rotation axis, and the wobble of our axis. The mass and movement of the other planets in our solar system actually affect the Earth orbit just as our planetary mass similarly affects their orbits. As the Earth's orbit changes, so too does the amount of sunlight that falls on different latitudes and in seasons. The amount of sunlight received in the summer at high northern latitudes appears to be especially important to determining whether the Earth is in an ice age or not. When the northern summer sun is strong, the Earth tends to be in a warm period. When it is weak we tend to be in an ice age. As we come out of an ice age, the sea level rises about 400 feet, and we enjoy a warm period 'like' the one we are in now. That is the natural cycle, brief warm periods followed by an ice age about every 100 thousand years. There are three general factors that determine the forcing changes in the Milankovitch cycles. The two terms you want to be familiar with in the Milankovitch cycles are perihelion and aphelion. These terms pertain to proximity to, and/or climate forcing from solar energy. Perihelion is when Earth spends more time in close proximity to the sun, or in the case of the tilt and wobble cycles when the northern hemisphere land mass facing the sun is closest to the sun, causing warming. Aphelion is the opposite, when the Earth spends more time during the year away from the sun, or in the case of the tilt and wobble cycles when the northern hemisphere land mass facing the sun is further from the sun, causing cooling. This is the longer cycle. About every 100k years. When the Earth orbit is elliptical we spend less time close to the sun in the span of a single year. This means we get less solar energy on an annual basis, and tends to cool the Earth. The Axial Tilt, or obliquity, varies to the plane of the Earth's orbit. This tilt, typically around 23 1/2 degrees can vary between 22 and 24 1/2 degrees. That means it can change up to 2.5 degrees over a period of 41,000 years. Increased obliquity can cause summers to be warmer and winters to be colder. So when our orbit is elliptical and our northern hemisphere, which is mostly land mass is tilted toward the sun, we can melt our way out of an ice age pretty fast in fact it only takes a few thousand years. As we attain a more circular orbit and the combined effects of the tilt and wobble work together in their natural cycles the Earth has a chance to cool again and we go back into an ice age. Inversely, decreased obliquity can cause cooler summers that in combination with other factors can help push the climate system into ice ages, when the this cycle is favorable for that condition. We are currently in a decreasing phase, which under normal circumstances, without the excess GHG’s, would cool the climate system. Next is precession, or wobble. This cycle occurs every 26,000 years. This gyroscopic wobble of the earths axis is driven by tidal forces which are influenced by our sun and moon. The Earth is actually not perfectly round so the gravitational pull tugs the axis over time creating the wobble cycle. Now there's a technical term for you. This departure is so dramatic that it has instigated a new era. According to some studies, there is enough evidence to state that we have departed the Holocene and entered the Anthropocene. Simply put, based on the evidence, mankind has forced the Earth climate system to depart from it's natural cycle forcing. 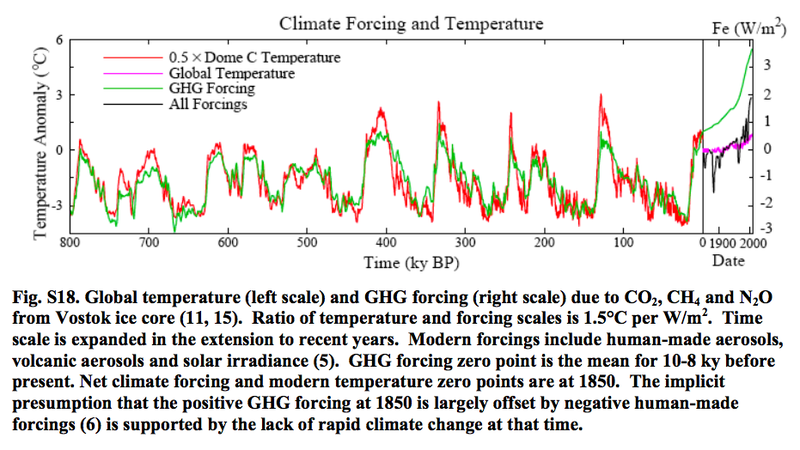 IPCC/UCAR – What Caused the Ice Ages and Other Important Climate Changes Before the Industrial Era?